It is very useful to be able to calculate the times at which the principal stars and constellations will rise in the east. It is also helpful to be able to predict the approximate position of the star or constellation in question. Professional astronomers and navigators have an array of tools such as almanacs, star-globes, computer software and the like at their disposal to help them make their predictions but such tools are not always available to all of us. Fortunately; however, there is a simple way of making these predictions without reliance upon published tables of data and other paraphernalia. The Earth revolves from west to east about its axis of rotation which is a line joining the north and south poles and if this axis is produced far enough, it would cut the celestial sphere at a point marked by the North Star or Polaris, as shown in the diagram below. 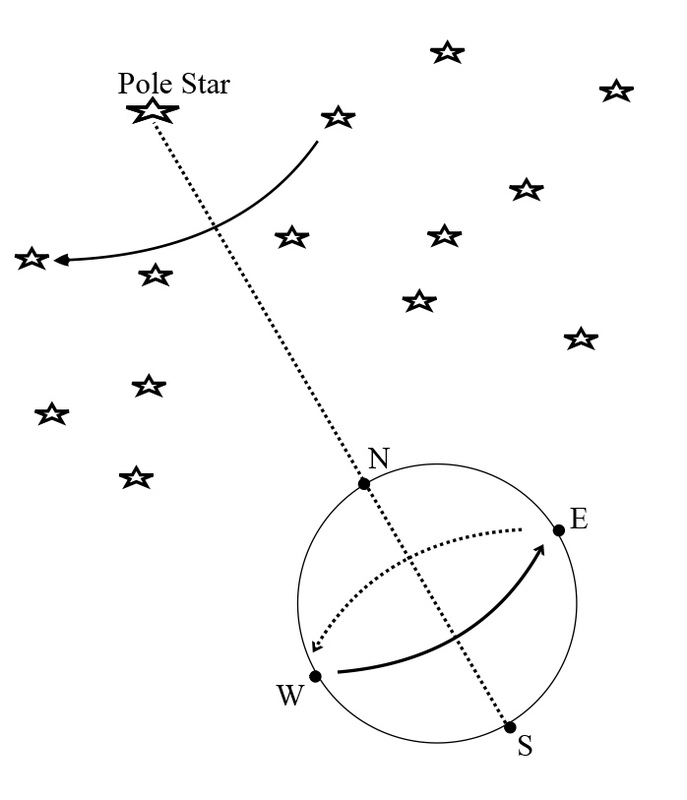 Facing north on the Earth, the Pole Star appears stationary, and the other stars appear to rotate from east to west around the Pole Star although in fact the positions of the stars are fixed and it is the Earth which is revolving from west to east. The time taken for a star to complete a circuit around the Pole Star is called a star’s day or sidereal day. If the sidereal day were to be exactly 24 hours then the stars would rise and set at the same times every day. However, the Earth completes each rotation about its axis in 23 hours and 56 minutes and so the stars will take the same amount of time to circuit the Pole Star and that is the length of the sidereal day. Therefore, if a star rises in the east at a certain time on a certain day, it will next do so 23 hours and 56 minutes later. In other words, the star in question will rise 4 minutes earlier the next day and this fact gives us the clue to the method of predicting the position and time of star rising and setting times. Arcturus is the brightest star in the northern celestial hemisphere and so we shall use it for this demonstration. Whereas the Pole Star is always above the horizon in the northern hemisphere, Acturus which is further south, will be below the horizon for part of its circuit of the Pole Star and so it will rise and set to observers in most parts of Europe and North America. Whether we wish to observe Arcturus for navigation purposes or for ‘star gazing’ we need to know when it will be above the horizon and so we need to be able to calculate its rising and setting times. As discussed above, professionals will have access to sets of published tables which tell them the times of rising and setting of all the major stars but we can manage without such tables. If we note the time of rising of Arcturus on just one day, we can easily calculate the time that it will rise on all following days as the following example shows. Say that Arcturus rises at 18.00 on a certain day; we know that it will rise again 23 hrs. and 56 mins. later so we can easily calculate that it will rise at 17.56 the next day (4 minutes earlier). In 30 days time, we can calculate that it will rise 30 x 4 = 120 minutes or 2 hours earlier; that is at 1600. It is easy to see that if we repeat this process for both rising and setting times for all the stars that we are interested in, we can easily construct our own table of data. Part 2 of this series (Finding the Positions of Stars and Constellations) will be published in the next post. This entry was posted in astro navigation, astronomy, celestial navigation, navigation, Uncategorized and tagged astro navigation, astronomy, celestial, navigation, Planning star and planet observations, Sidereal Time, star and planet observations. Bookmark the permalink.